Welcome to my review! Today I will be talking about a figure of Souffle Rossetti ENTRY #10537 from Star Ocean: Till the End of Time ENCYCLOPEDIA #9945 ! This figure ITEM #5039 is made by Kotobukiya ENCYCLOPEDIA #7621 . 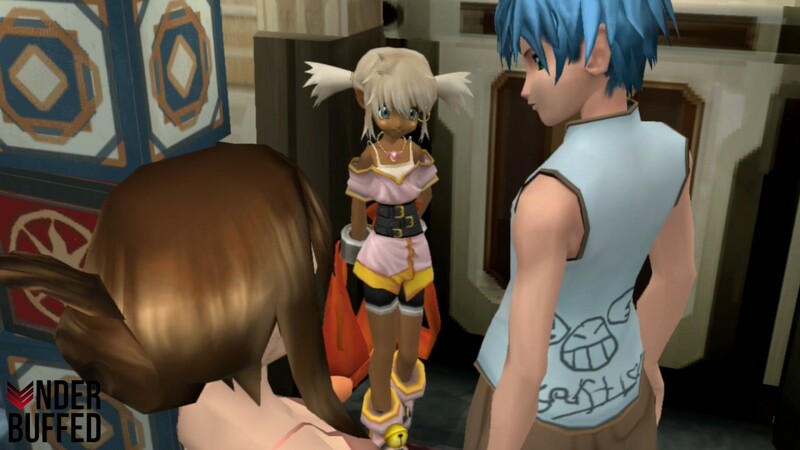 Star Ocean: Till the End of Time is the third Star Ocean game and was released for the Playstation 2. It is an JRPG with real-time combat. It it similar to the .Hack and the Tales of- series when it comes to gameplay. Souffle Rossetti (called Peppita Rossetti in the English version) is a performer from the Rossetti Troupe. As you can see from her oversized shoes and bangles in her design, those are her weapons when she fights in the party. Just as with my 'retro' reviews of Roger S. Huxley ITEM #5040 / BLOG #10095 and Cliff Fitter ITEM #1768 / BLOG #9586 , I haven't played any game of Star Ocean myself. I have been interested in trying it, but never came across affordable copies of the game. So I still can't give my opinion on the games or the characters themselves. *edit* VICTORVIPER let me know that they recently put out an HD remaster of this game for the PS4 if you're interested in checking out the game! As with the other 2 from this set, I got a really cheap deal on her. I don't remember the price I paid for her anymore (I bought her almost 10 years ago), but I remember it was secondhand from an anime forum. I thought her design was super cute, and later on I bought the matching Cliff and Roger. ...but it is interesting to point out that this figure is more modelled after her 2D artwork. Especially when it comes to the hairstyle and colors. Souffle comes in a similar looking box as the rest of the set. Quite simple in design, but stylish. I'm also intirgued by all the English text on the backside. Seems like this run of the figure had a special box made with all the information for the US-distributor. I like how it mentions that the figure is 'ready to display right outside of the box', something that was less common during the time this figure was made. There is one strange thing with the box, though. In the English version, Souffle is called Peppita. However, the box mentions her Japanese name in English writing. She is packaged in a very old-fashioned (but normal for it's age) way: A blister with only back-packaging and the figure itself was held in place by wire and clips. I remember this type of packaging as quite tedious when most figures came this way. As you may have noticed from my box shots, I didn't even put the wire back when I stored her. The figure is one solid piece with not much parts that can break, so I wasn't worried. Isn't she a cutie? The posing may be simple, but it is very effective. I also like how much the red fabric stands out from the rest of her outfit and the base. Keep in mind this is a review of a scaled figure from 2003, so the quality of this figure is more comparable to prize figures, than nowadays scaled figures. The first thing that attracts me are her huge, bright eyes! Her eyes are not a decal, they are handpainted and it looks very crisp! She also has some cute blushes on her cheeks. Her outfit is quite a simple lilac tunic with yellow borders, with as detailing three belts around her waist. The belts aren't perfectly painted, but look decent enough. Her hair has quite a wild design, with the ends of some of the pieces looking a bit clunky on the figure. There is a tiny bit of shading near the end of the hair. The hair has more small defects in paint and a few botches in the plastic when you look at it from the side. I do like the look from her necklace. Except for a bit of the red paint bleeding, it looks quite detailed. Also from the backside the paint is a bit messy here and there, such as the white on the tanktop and the gold on the necklace. I do really like that they went through the effort of having her left earring show from the backside. Also the layering from the outfit looks quite good, it's nice that they sculpted her tunic as a seperate piece. This angle is so cute for this figure! Souffle wears a ring on every finger and these are painted quite neatly! I also really like the oversized bangles in her design, they were also sculpted as a seperate piece and look very clean. The red fabric attached to the bangle comes from the ribbon that is on the backside of Souffle's outfit View spoilerHide spoilercan you imagine the hell a cosplayer must go through if they want to make this a wearable outfit?. A lot of her attacks are based on her swinging around with the (probably heavy?) beads at the bottom of the fabric and hitting enemies with them. It's such an unlogical design in real life, but it looks very good on this character design and figure! There is some minimal shading on the red fabric (mainly seen in the middle of this picture). The fabric has some wrinkles and a bit of movement sculpted in, which is a very nice detail. The fabric continues to her other arm, where a similar sculpt and shading is to be seen. I also appreciate the sculting of her right hand, it's quite delicate. Her legs are posed in a very cute way. Souffle wears black spats with a small white border. The white border fits a lot with her tank top, must be a matching set! Her shoes have an 'oversized' design, making them look extra cute on her. Both the detailing and the paint is probably the most crisp here in comparison to the rest of the figure. I like how the shoes look like a miniature version of her tunic, belt included. Souffle's base is a big transparant blue oval, with copyright information on the bottom. It's very reflective and holds the figure well, but it's not really special. - Cute character design with bold colors. - Some messy paint here and there. - Shading is very minimal. - There are some chunks of plastic missing in the sculpt, this is mainly visible in her hair (could vary on each copy). It may seem simple by todays standards, but for an almost 15 years old figure, I really appreciate the sculpt. There are a lot of wrinkles in the fabric, details in her shoes and let's not forget all the jewellery she wears! There is quite some paint bleeding at the smaller details. There is only shading in the hair and the red fabric. Some parts however, have very clean paint, such as the shoes. Very cute! Souffle seems to be leaping at you! And her waving left hand makes for a lot of cute angles to take a look at her. Nice box design, although a bit simple. Protection is minimal, but it's a very sturdy figure. So it's good enough. I had a lot of fun with this figure and had her on display in my collection for almost 10 years! I decided to sell her a few months ago, because my collection became too big and I only want to collect from favorite franchises. If it wasn't for my rule there, I'm pretty sure I still would have had this cutie! For nowadays standards this figure is a bit simple, but her character design is really cute. She is absolutely not flawless, which is why I would compare this 14-year old figure with the quality of prize figures nowadays. If you are a fan of the Star Ocean franchise, I definitely reccomend you to get her! This figure seems to be more available on the second hand market in the US and Europe than on the general second hand Japanese sites (it could be that this is because of the distributing the figure had). Right now I don't see her in stock at the general stores, but it seems that the last few times that they sold Rosetti in Japan, her prices were around 2,5-3K yen. Most people selling her in Europe or the US ask a price of around $20-$30 for her, which is also very fair. This figure is sold now, but this is how I used to display her in my collection a few years ago! For those who read all this way, thank you! My next review will be about Kawai Ameri's figure by Orchid Seed ITEM #13798 .
blueberrywaifu (1 year ago) #26984414Neat, I never knew there were figures made for the SO3 cast. I also didn't know her name was Souffle in the Japanese version, that cleared up some confusion in an early cutscene in the game for me. Very minor spoiler: When Peppita first meets Fayt, she signs her autograph on the back of his shirt. Even with her bad handwriting, the autograph clearly doesn't spell Peppita... and now I know why! Aw, that sounds so cute! Is it this scene? Because I can sort of read 'Souffle' there, haha! Neat, I never knew there were figures made for the SO3 cast. I also didn't know her name was Souffle in the Japanese version, that cleared up some confusion in an early cutscene in the game for me. EnvyNeko (1 year ago) #26837945The thing that always bothered me about this set is that a few of the playable characters were missing. Namely, Albel, Mirage and Maria. This is frustrating considering Maria plays a big part in the game compared to Roger but he got a figure instead. Personally I’m more upset about Albel not getting a figure because he’s one of my favorite characters. To be honest, I'm actually quite amazed that Kotobukiya already made this a 2x 3-figure set, as that's already quite a big chunk of the cast and Koto wouldn't take such risks anymore nowadays! But I can understand your disappointment as a fan of the game! Maybe Koto was originally planning another set of 3 if these sold well? gemelli (1 year ago) #26840662I used to have all of the characters of this set save for Sophia, but I decided to sell them off because I wanted to limit my collection to absolute favourite characters (and considering this set didn't include a figure of Albel...yeah, off it went). The game is decent; the combat system is a lot of fun, there's a lot of content and I like some of the characters, but the story has some pacing issues and some characters have a VERY annoying voice. But yeah, this one looked the best of the figures from that set (closely followed by Nel); it's so cute and colorful! But yes, good review! Yeah, I think I remember seeing this (partial) set in your selling topic on Aniway! And ouch, bad voice acting still happens, but with PS2/Gamecube era-games (and older) it was even worse, I still cringe when I think back to Baten Kaitos, although I love the game itself! I used to have all of the characters of this set save for Sophia, but I decided to sell them off because I wanted to limit my collection to absolute favourite characters (and considering this set didn't include a figure of Albel...yeah, off it went). The game is decent; the combat system is a lot of fun, there's a lot of content and I like some of the characters, but the story has some pacing issues and some characters have a VERY annoying voice. The thing that always bothered me about this set is that a few of the playable characters were missing. Namely, Albel, Mirage and Maria. This is frustrating considering Maria plays a big part in the game compared to Roger but he got a figure instead. Personally I’m more upset about Albel not getting a figure because he’s one of my favorite characters. Azaka (1 year ago) #26790450Actually it's the the other way around xD Maybe for the start there's a lot of cutscenes to setup the story but quite fast you will actually notice there's a lack of cutscnees and too much dungeon crawling and battles in the middle part of the game. victorviper (1 year ago) #26713614I like RPG's, but I seem to remember getting frustrated that there were too many cutscenes and not enough actual gameplay. Actually it's the the other way around xD Maybe for the start there's a lot of cutscenes to setup the story but quite fast you will actually notice there's a lack of cutscnees and too much dungeon crawling and battles in the middle part of the game. If you visited cons over here around 10 years ago, there was a chance you could get the whole set in 1 go by shopping at the different stalls. xD It seems like there were so many a few years after release on the aftermarket! I like that when looking back on this set, their quality seems so decent compared to others of the same age. I used to have many scaled figures with shiny skin from that era, none of them in this set have. star ocean: till the end of time?